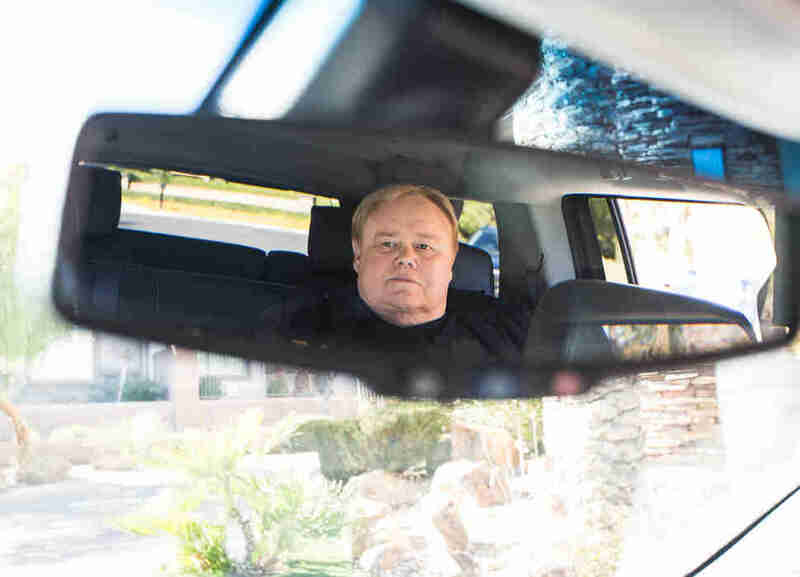 "Sorry, I'm in Las Vegas at a Costco with Louie Anderson." That's the third time I've used a variation of that line since arriving here and, as far as excuses go, it has to be my personal favorite. It's the kind of demurral so surreal that -- like, say, "I'm trapped on a depowered cruise ship" or "Val Kilmer just stole my car" -- you can't help but use repeatedly while it still applies. 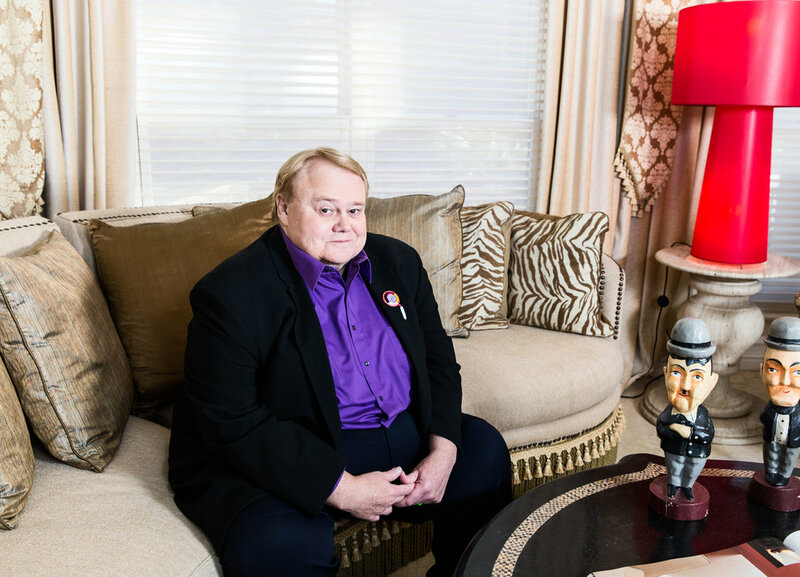 Louie Anderson is a name (or, at the very least, a voice) recognizable to many. If we were to survey 100 people where they know him from and put the top five answers on the board, there's a very good chance that "Family Feud host" would clinch the top spot. But it would quickly be followed by "stand-up comedian," "creator of the Emmy-winning Life With Louie," "Wait, isn't he dead?," and -- as of 2016, thanks to one of the most unexpectedly daring comedic performances on cable TV -- "Christine Baskets." 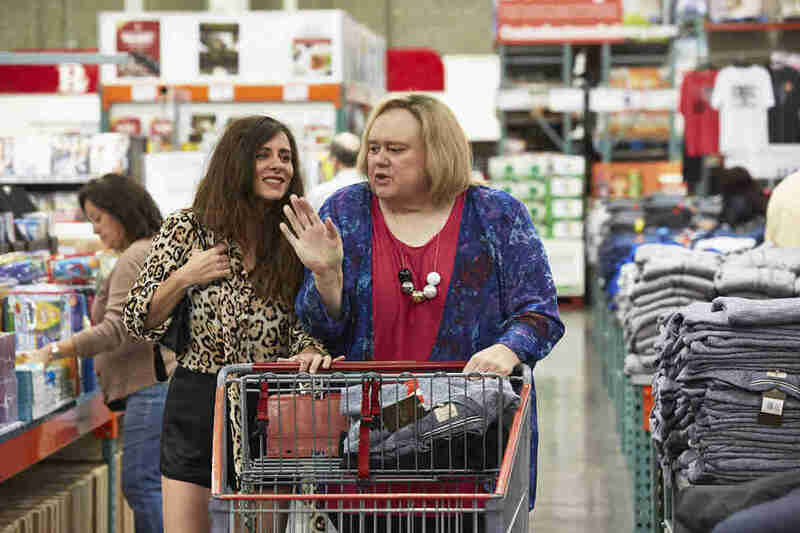 It's because of Christine Baskets that I find myself in Las Vegas at a Costco with Louie Anderson today. Christine is the character Anderson plays on Baskets, the surreal FX comedy co-created by Zach Galifianakis, Louis C.K., and Portlandia's Jonathan Krisel about a miserable French-trained rodeo clown named Chip Baskets. Adorned with a wig and a dress, and an authenticity that makes me hesitant to use the word drag, Anderson plays her as a billowing maternal presence that lends a sweetness to the show's bitter brand of humanism. The only thing Christine prizes as much as motherhood is her Costco executive membership. The megastore plays a big role in the character's life -- in this week's episode, "Uncle Dad" (airing tonight at 10pm ET), Mama Baskets takes her son's freeloading French wife on a tour of the bulk-shopper's paradise -- so we thought it would be fun to accompany Louie, a gold-star member himself, to that cathedral of consumerism where you go when standard units of measurements aren't enough and you need a bale of sweaters or a drum of ranch dressing. "Can you believe how busy this place is?" asks Louie. The entrance is buzzing with more people than you'd expect for a Tuesday afternoon, although to be fair, Las Vegas tends to have as regular a sleep schedule as a vampire with a coke habit. Louie grabs a shopping cart and I wave my wife's membership card in the vague direction of the attending security guard. "Kind of a loose operation, isn't it?" Louie says as we enter the belly of the beast. As the store's HVAC system hits us like an arctic gale, Louie's cart seizes up. "Oh, God," he says. "What a cliché that I got the cart with the bad wheel. But I think we should keep it, it's got character." "I'm a TV junkie, are you a TV junkie?" We're standing in front of a display of 75-inch Samsung TVs located inexplicably close to the front entrance. "I want to get a new TV, but I just toy with it. I go, 'Ugh, do I need a new TV?'" Louie has spent a prodigious amount of time both in front of TVs and on them. He made his debut on The Tonight Show on November 20th, 1984, fulfilling a lifelong dream. "You know, I was a kid who used to watch The Tonight Show with my dad in St. Paul, Minnesota," he recalls. "He let me stay up to see the comedians because I liked the comedians, and he was a musician so he liked seeing Doc Severinsen." Louie killed with his set and Johnny Carson asked him to come out for a bow and a handshake, the late-night legend's well-known imprimatur for comics he especially liked. In addition to a small role in Coming to America, Louie landed HBO and Showtime specials that successfully mined laughs out of the permafrost of his Minnesota youth as one of 11 children of an alcoholic father. Eventually those specials were used as the basis for Life With Louie, his autobiographical 1996-98 animated Fox series that remains one of Louie's proudest achievements. But The Louie Show, a live-action CBS sitcom that only lasted six episodes in early 1996, didn't fare as well. "Bryan Cranston was in that, and Paul Feig was great in it too," Louie says. "I always had great people around me but I wasn't always able to execute. But you can't cry over spilt milk. And I got a chance this past year to really create something with Baskets. It was the first time in my life that I said to myself, There's no complaining on this show, Louie, and you cannot say no to anything no matter how much your legs hurt or how tired you are, or how anxious you feel or how scared you are. You can only say yes, you can never say no." 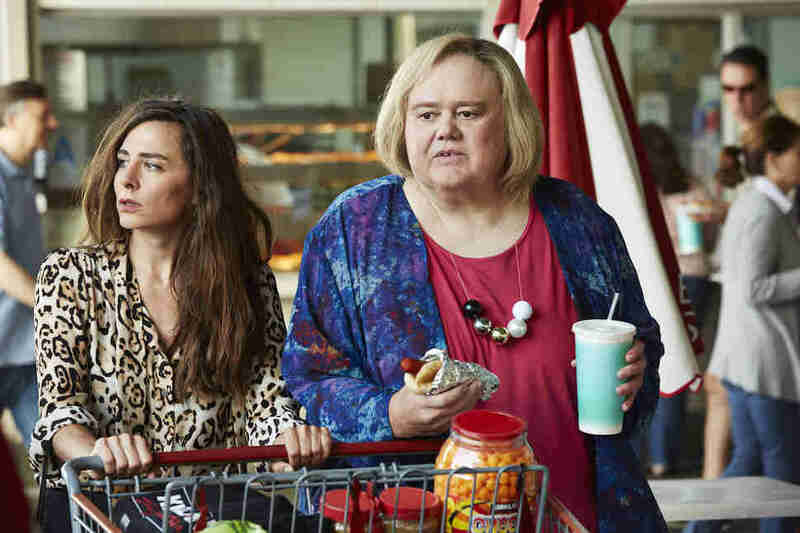 Baskets depicts its setting of Bakersfield, CA, as a world of dank dive bars, sun-broiled parking lots, and sprawl too low to the ground to offer any shade. Certain low-middle-income brands are repeatedly name-checked -- Kirkland, Arby's, and, of course, Costco -- used equally as punchlines and place markers. It's the same arbitrary specificity that lends Louie's cross-gender casting and my reused excuse their left-field hilarity. In reality, Louie's casting did come about almost entirely on a whim. "From what I understand, Zach said, 'It's a sound,' and he made this sound for the mom character," Louie recounts. "And Louis C.K. 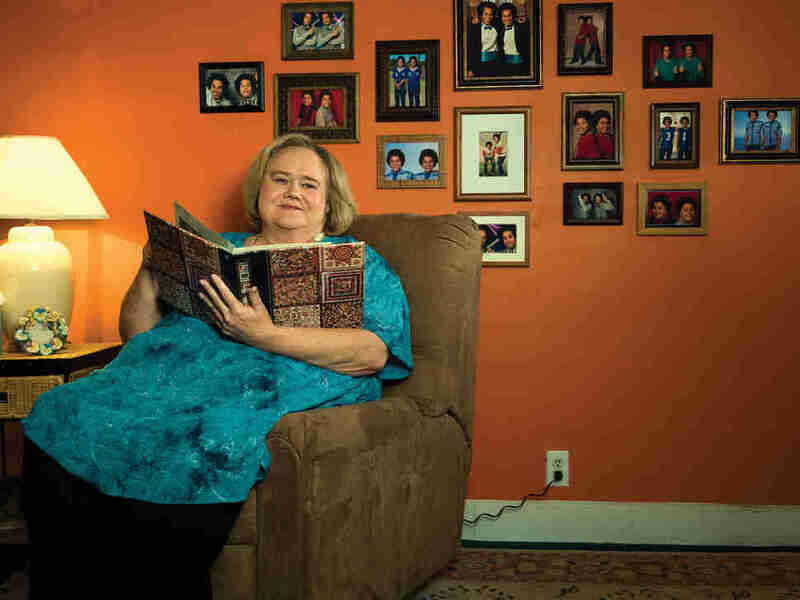 said, 'You mean like Louie Anderson?' So they called me." Louie accepted the offer immediately, not even hesitating when he heard the role they wanted him for. "These guys are comedy royalty right now, to me at least," he says. "Plus, nobody else was asking me for a job either." Louie has been performing stand-up every few months at the South Point Casino, honing material for a special he's been putting together, but the last time anyone called with a gig was in 2013 when ABC wanted him for the celebrity diving reality competition Splash. 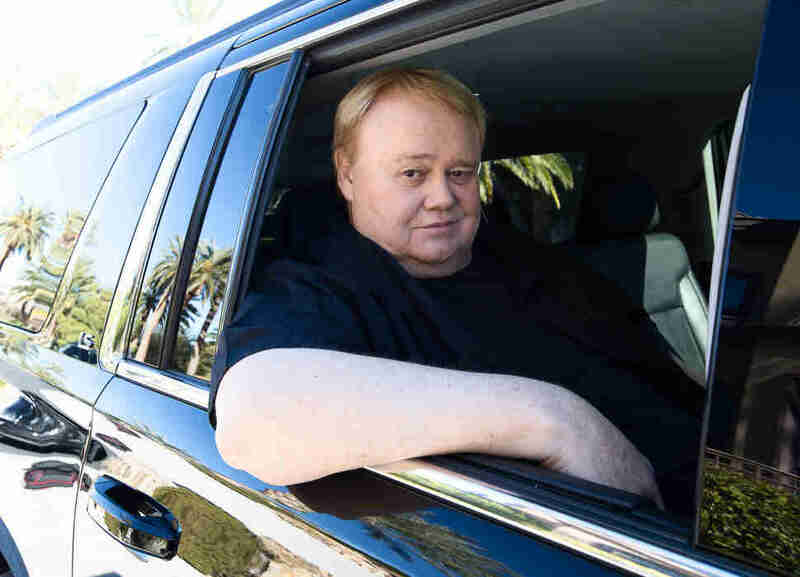 He's proud of what he accomplished on that show -- he says it was his way of making up for gym class all those years ago -- but it would be fair to say it had been a while since Louie Anderson was last in the mainstream comedy conversation. "You know what the best thing is? Not them offering you for a job, but just thinking of you," he said on the car ride to the store. "I've been 37 years in this business and for somebody to pull that bobber out of the water and to have me as the thought behind it, it's a great feeling." "Oh my God, this is amazing. Clothes as far as the eye can see," he says, fighting with the recalcitrant cart as he maneuvers it past drifts of ski parkas and mountains of washed denim. We walk by some sundresses that might look good on Christine. The clothes may make the man, but they can also make the man a woman. "I got the wig on and I immediately looked like my sister," Louie says. "When you put a wig on that makes you instantly a woman, you just go, 'Huh.' I didn't know what to think of myself. I laughed a little, I giggled I think. It's a little weird, but it's much cooler in a skirt, I'll tell you that." A middle-aged woman walking by overhears this last bit and turns to Louie without stopping, "You said something was weird. You must be talking about women, they're real weird." She doesn't wait for a response before pushing on past us and off toward lawn care. Louie stares after her. "Well now, how funny is that?" "When you put a wig on that makes you instantly a woman, you just go, 'Huh.'" He picks up a four-pack of reading glasses from a display. "What do you do, throw them out after each book? You know who would have really liked this place? My mom. Eleven kids, the newest stuff, the most stuff, it's clean and nice here. This is a Midwesterner's dream." Louie first found the voice for his mother on stage in 1979 and she's been a major part of his material ever since. For Christine, he assembled elements from his mother as well as his five sisters. "For 37 years I've been doing my mom's voice," he says. "Her looks, her disappointment, all that stuff. It was good practice. But Christine is meaner than my mom ever was." While on set, Louie stayed in costume and in character, inhabiting Christine's reality as much as he possibly could. "Maybe I was meant to be a woman," he ponders. "I look just like my mom, so I favor that physical side of the family. Everybody who looks like her is overweight and everybody who looks like my dad is drunk. That's a joke. Nobody ever liked me doing that joke. Isn't that funny, when people don't want to hear certain jokes? OK, now where do you think the prescriptions are?" We finally cross paths with some of Costco's famed free samples. We give the apple-kale-mango juice a pass. I grab a caramel, which proves inadvisable for interviewing. While downing cups of dried pea snacks, we enter an aisle that looks like a meth chemist's candy store: every medication imaginable sealed in huge clamshell packaging and stacked on the shelves. Louie reaches down and grabs three jumbo packs of Prilosec, tossing them into the cart. "These are $22, just one of these, in the drugstores," he advises. I point out that Christine also buys heartburn medication at Costco in the episode airing this week. "I like to make it real. I told them that for the show I wanted to get real stuff," he says. "If I didn't have my hat on, people would be talking to me," Louie says. "Isn't it funny what a hat will do?" The hat in question features a cartoon drawing of a piece of toast. Louie takes it off his head and the experiment begins. We continue down the aisle and exactly five seconds later a man waiting in line recognizes Louie and asks him how he's doing. "I was until I got in line," says the man. "If I didn't have my hat on, people would be talking to me," Louie says. "Isn't it funny what a hat will do?" We round the corner and immediately run into another valued Costco shopper who nods knowingly at Louie. That's two in 13 seconds. "I couldn't have scripted that if I had planned it," laughs Louie. "Am I right? I was shocked actually." At that moment a morose-looking woman in a purple top trudges by. "Watch out for those lines," she mumbles at him. "They're killer." Louie just smiles after her. "Thanks for the heads-up, am I right?" he laughs. "I love people, man. People are the best thing going. They always manage to make me feel better. Hey, why don't we head to the furniture department so we can sit." We find a comfortable leather couch and take a seat, watching the store's constant flow of humanity. Almost immediately, as if cued from offstage, a harried-looking woman jogs by carrying a precariously balanced chocolate cake in one hand. We anxiously watch the set-up in anticipation of a messy punchline, but she rounds the corner with the confection still intact. "There's bravery right there," Louie says. "Am I wrong? A waitress for sure. Nothing would make us happier, though, right? Anybody you see carrying any kind of pastry, you know it should end up in their face somehow. It's meant to be." Put that way, the cake lady almost seems like a cosmic signal from some higher power of stoogery, a reminder that comedy might be lurking right around any corner. Louie of all people understands this better than anyone. Walking through Costco you can hear him working through potential material, testing things out, and peppering the conversation with a stand-up's arsenal of rhetorical questions: am I right? Am I wrong? Have you ever noticed...? Isn't it strange...? "A great comic is great at searching their soul for what they want to talk about," Louie says. In all of his work, there's one topic that the comedian has visited and revisited more than any other: family. Louie has become the binding force for his numerous siblings over the years, the gravitational center around which the rest of the family orbits. (No doubt Louie would make a weight joke here.) When I first visited him at his house, his brother Jim was chilling in the basement watching the New Hampshire primaries. "I'm so close to my family," he says. "I lost six you know. That's heartbreaking, that's a heartbreaking thing." His voice catches slightly as his eyes start to tear up. "And I just lost my niece. You know, that loss stuff. That's what I'm good at writing about. I'm good at mining that, because I feel it all. You know, I heard you can buy caskets here. That's really weird. I just remembered hearing that because we were talking about death. 'Go down and get me some milk, and get a casket for your father.' Right, that's the joke, isn't it? 'We might as well have one, he's not feeling well.'" "You know, I heard you can buy caskets here," Louie says. "That's really weird." "So, anyway, losing all those people made the rest of us closer because it's so painful," he continues. "You don't really realize your life is finite until your mom dies, that's what I think. I'm trapped in that mom stuff, no matter how you look at it. Because my mom was the savior to my alcoholic father and the nemesis too. Why didn't she leave, right? But even though she didn't leave, as crazy as this might sound to you maybe, even if your family is abusive, if your father stays it's better than if he leaves in some ways. He's my father so at least he didn't abandon me. Because I've met people whose fathers have abandoned them and they're damaged differently than I am. I can work through my stuff, they can't always work through theirs. God, you know what, I think I'm gonna need to take a Prilosec." A woman walks over and taps him on the shoulder as he sits there on the couch. "Excuse me, are you the actor?" she asks. "Family Feud?" Louie tells her that indeed he is and readily agrees to take a picture. The woman then cajoles her reluctant teenage daughter into taking a picture with him as well. The girl sits down next to him on the couch, looking mortified in her parental embarrassment. Louie puts an arm around her. "You don't even know who I am. But it's better to get it over with isn't it?" he says as the mother takes the picture. "I had a mom too. She seems like a nice mom, is she?" The girl nods. "That's good," Louie says. "Moms are important." Louie takes one look at the throngs of shoppers congesting the checkout lines and leaves the cart of Prilosecs, with its one wonky wheel, exactly where it is. "That line'll give me more heartburn than these would cure," he says. On our way out, he's recognized once more. The man tells him that he and his then-girlfriend (now-wife) saw him perform in the early '80s at the Comedy Store in Los Angeles. He even recites Louie's opening joke from all those years ago. "Isn't that just amazing?" he says as we walk out into the day. "Just amazing." Just for the record, of those surveyed at Costco, two knew him from Family Feud, two from stand-up, but most just knew him as Louie Anderson. Keith Staskiewicz is a writer based in Los Angeles and a recovering Costco addict. This is his first article for Thrillist.